Point-of-Purchase wood displays have been increasing in popularity over the last several years. Why is that the case and is the trend likely to continue? There are several underlying drivers of this trend, and yes, we expect it to continue. Among the key drivers of the trend toward wood displays has to do with shrinking planning horizons and good old fashion economics. As recently as 5 years ago, merchandisers had pretty good visibility on their needs at least 6-12 months in advance. However, in today’s environment traditional retailers and brands have reduced staffs and tighter budgets, both of which have impacted planning and POP display purchasing patterns. In addition, retailers and brands have been forced by the increased competitive intensity of the industry to be more nimble, to react quickly to near-term opportunities and rapidly changing trends, and to respond to continued threats from online retailers. The net effect is that rather than placing larger orders well in advance, retailers and brands are placing smaller orders with the expectation of faster turnaround times. These underlying forces at work are driving an increased surge in domestic production at the expense of overseas production. This trend toward just-in-time production is important to understand and outweighs all of the buzz about tariffs and the political rhetoric surrounding trade wars, etc. So, here’s where the economics come into play. The cost to produce metal displays and even acrylic displays is significantly higher in the U.S. compared to overseas. 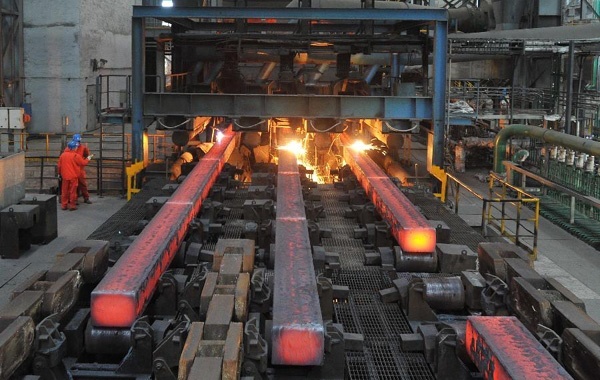 This is driven, in part, by a robust steel industry in China in addition to lower labor rates, a very efficient manufacturing economy, and a highly developed and mature supply chain. When it comes to wood displays, however, there is virtual economic parity between China and the U.S. The primary reason for that is that China has no trees (Ok, they have a few, but they are skinny). Therefore, China has to import its wood, whereas the U.S. has an abundant supply of trees and a very sophisticated forest products industry. For some displays that require high finish levels or are highly labor-intensive to produce, manufacturing in China might offer an advantage, but for the vast majority of wood displays, the cost to produce in China vs. the U.S. is relatively close. In addition to the economic rationale for the trend toward wood displays, there are a host of reasons related to tastes and preferences that help to explain why wood displays are in favor. Natural products are hugely popular today, and many brands like to merchandise their products on wood displays to ensure they are presenting a consistent brand message. 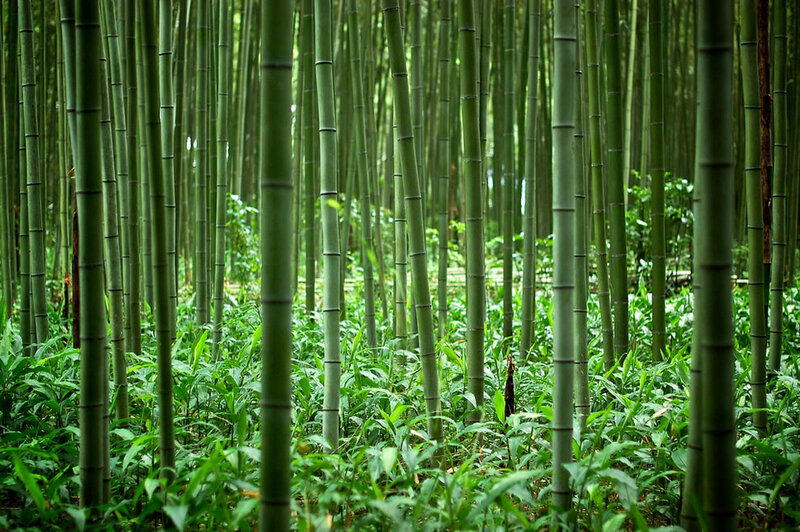 Sustainability is also becoming a mainstream value, and a renewable resource like wood and even more sustainable materials like bamboo address the environmental concerns that are top-of-mind for many consumers. Aside from economics and consumer preferences, wood is super versatile and offers a wide range of choices for manufacturing POP displays. There are many species of wood, lots of wood composite and wood derivative products (like MDF and particle board), and a plethora of stains, paints, and finishes that can be applied to create unique looks. We’ll review just 3 of our 10 examples in today’s post. In Part II of this series, we will dig into the remaining 7 examples. 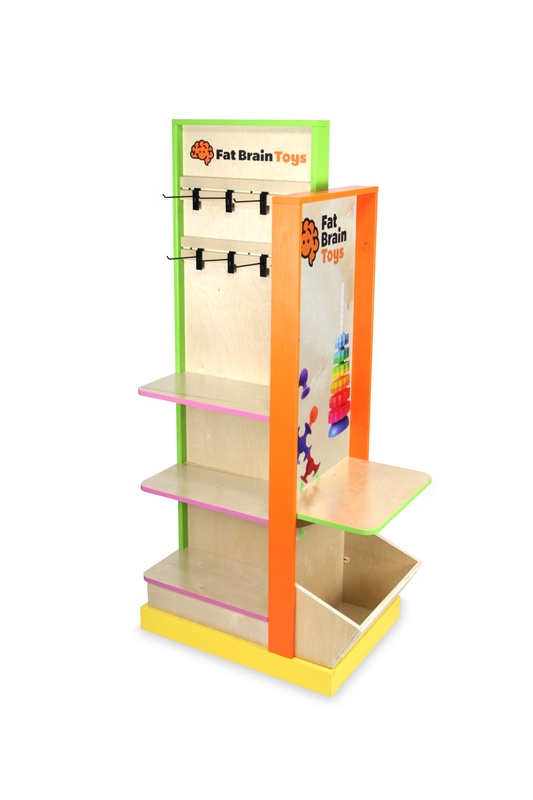 Our first example is a wood floor display we made for Fat Brain Toys. This display uses a combination of solid pine with colorful painted colors and pre-finished birch plywood. We applied colorful vinyl graphics to the smooth surface of the birch plywood to create a display that would attract and capture the imagination of every kid. Our second example is a simple and cost-effective wood pegboard display we made for Zippy Paws’ line of leash products. 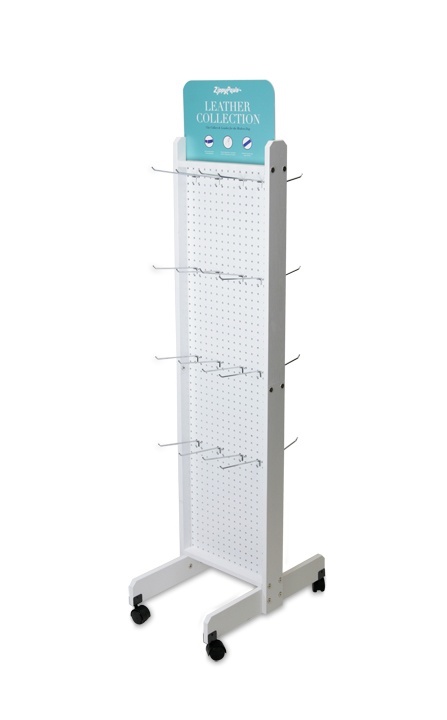 This 2-sided solid wood fixture features a narrow footprint with locking casters, a white painted finish, a center pegboard panel with metal hooks, a 2-sided PVC header sign, and knock-down construction for cost-effective shipping and storage. We’ll continue with the pet industry for our final example today. 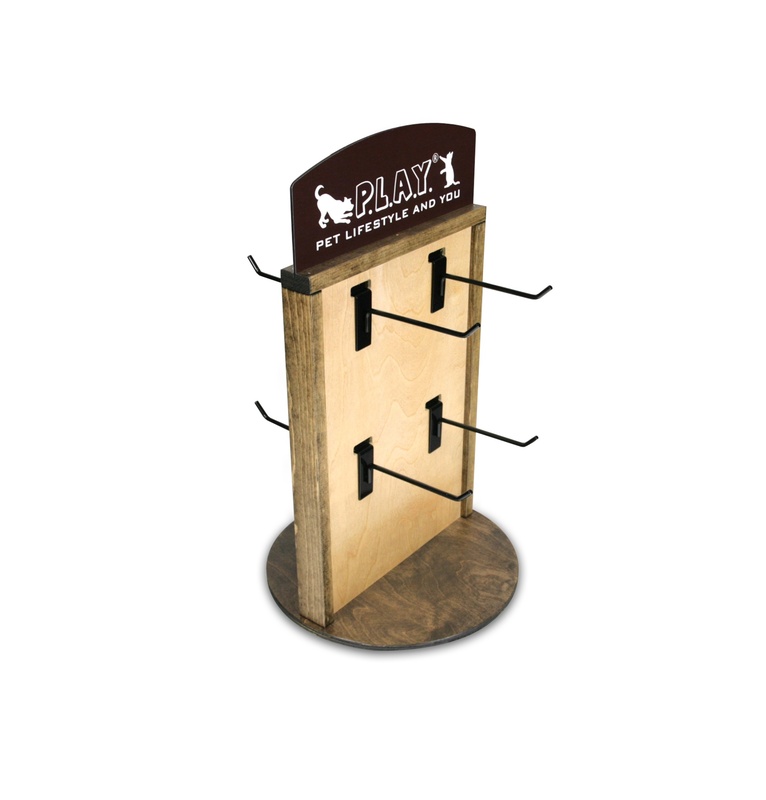 This one is a spinning 2-sided counter display we created for P.L.A.Y.’s new line of cat toys. It features a solid pine wood frame and base with a walnut stain, a contrasting slotted birch plywood center panel with slatwall hooks, and a die-cut PVC header sign digitally printed on 2 sides. Be sure to check out Part II in this blog series where we’ll share 7 more examples of wood displays.